RollerCoaster Tycoon Joyride can be played without PlayStation VR, so if you’re looking for a builder-sim game fix, this is still an option. This is, however, going to appeal more strongly to those of you with a PlayStation VR headset and a strong pair of VR legs. 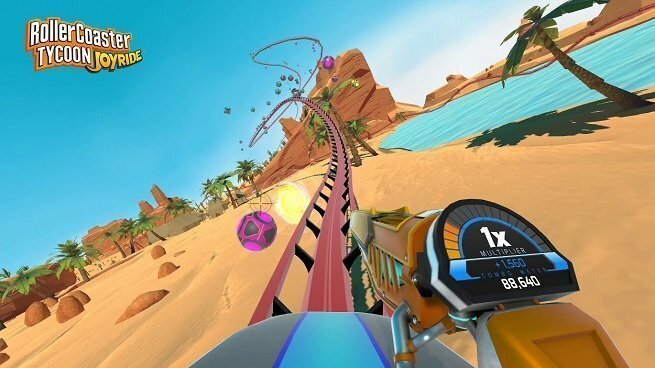 We thought that Trackmania Turbo VR was the craziest idea, and then we saw WipEout Omega Collection. WipEout held the crown as the most intense PSVR experience for months, but now, RollerCoaster Tycoon has usurped the throne. This is not for the weak of heart. If you’re not much of a builder yourself, but you want to experience some virtual theme-park insanity, we have great news for you: You will be able to download other users’ creations straight from the PlayStation network. It’s like the Super Mario Maker of roller-coasters, so you know things are going to get really crazy, really fast. Freeform Coaster Builder: For the first time, players can experience a roller coaster builder optimized for console and PSVR allowing them to build any roller coaster they can imagine in minutes. Single Player and Multiplayer: Play through the progression system and sandbox modes or challenge friends to a build and ride in a couch multiplayer party to compete for the title of “RCT Build Master”. Stunning Environments: Explore and ride through the wild and hot desert of the Canyon for a daytime thrill-ride or the captivating skyline and streets of the City as you embark on your adventure at dusk. Social Features: Share your incredible roller coaster creations via PlayStation Network. Are you brave enough to ride a virtual roller-coaster? Grab your barf bag, give it a whirl, and let us know how it goes by leaving a comment on Facebook or Twitter. We’d love to hear your experiences!